Idea: Capable with mundane matters, but supernatural happenings get taken care of by the community itself … or by Connor O'Reilly. Description: Widely held in high regard, the Seattle Police Department has had controversy in the past, such as its response to anti-Chinese riots in the late 19th century, a similarly poor response to riots in the 1999 WTO meeting, and poor handling of Mardi Gras riots in 2001. In general they are clueless in responding to crimes with a supernatural component, but Seattle's spooky community polices itself so such conflicts are rare. 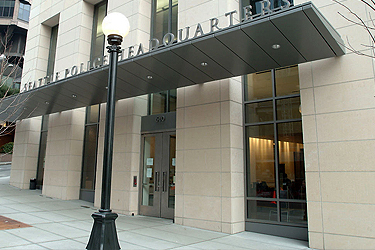 The SPD maintains contacts with several cultural advisory boards (such as one for Native American issues and Chinatown's community), which simultaneously helps the SPD to deal with them more sensitively and insulates the Department from the most bizarre paranormal happenings in the city. Since Mayor Collins took office, she has kept steady pressure on the SPD to keep crime, or at least crime statistics, as low as possible, while she has simultaneously frozen budget increases to the department due to city cashflow issues.